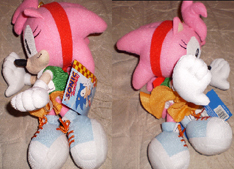 This page will have a focus on 2009 plushes, likely from GE Entertainment and Jazwares. Vintage plushes may still appear, but they'll be noted by their entry. 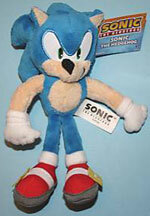 Will Sonic plush become highly collectible again now that it is away from ToyNetwork? 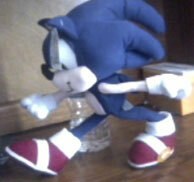 Stay tuned to SonicGear to find out what happens. 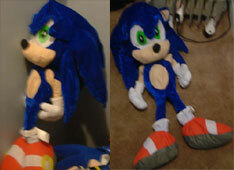 Here are Jazwares first 3 efforts at Sonic plush making. Their first run has Sonic, Shadow, and Werehog all at 7 inch scale. Each one is made of fuzzy fabric and has embroidered edges to their eyes. Shoe details such as Shadow's glide-emitter holes and Werehog's 'spikes' are drawn on. 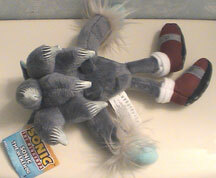 With all 3 dolls, details were not neglected, such as Shadow's glove/sock cuffs, Werehog fangs, Sonic Shoe buckles and the dingyness of the Werehog's shoes. However...The Werehog is clearly their best effort here. Sonic & Shadow suffer from super thick arms, wrinkly distorted little hands, flat large noses, and somewhat 'off' expressions. 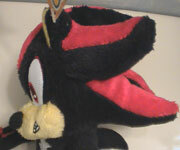 Shadow especially suffers due to his odd eye construction and distorted looking spikes. These dolls can't be written off as 'too small' because other vintage dolls did a better job of detailing at the same scale. 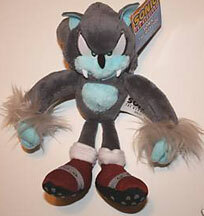 These should be available in the fall of 2009 at Toys R Us in the USA starting with the Werehog. All dolls are $8.99 each. With these back photos, you can see the werehog uses fabric-paint (semi glossy) to make the different color at the ends of his spikes. 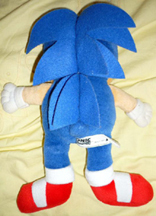 Shadow/Werehog tail and back spikes are flat pieces of the body fabric. Side view is provided of his head as it shows that...it does leave some to be desired. 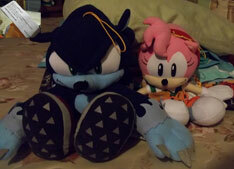 The 'feel' of all of these plushes is very soft. The fabric has many tiny silky hairs, and is the same on all 3. If only their faces were better, this would be a solid little plush line, as they're construction and fabric variety is good. The price isn't so hot, at nearly 10 dollars (with tax) for such little things that don't have the best design going for them. Here's a bit of a 'before & after' look at some of what Toy Network has done. 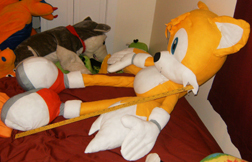 The 4 ft. Sonic to the left was made earlier in their run. As you can see, it's actually pretty nice. Though the brow ridge is getting a bit out of control, and the ears are flopped foreward, it's still a good effort which is unusual for them. The second one at the right is only half the size (at 2 ft) but in their newer 'style'. 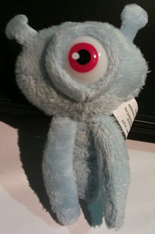 This means completely understuffed/wilted and with odd decal eyes. It looks like he's melting, that's not a 'feature'! The fabric is also a darker blue. 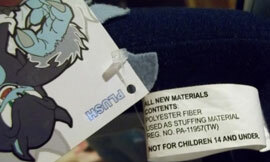 The 'wilting' understuffed plushes are now common (2009) in any of the larger Toy Network sizes. Look at this Classic Style Amy Rose! 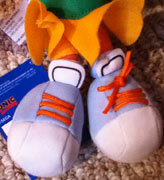 This is a fantastic plush, perhaps even one of the best ever done in America. Look at all of her details, including: real shoe laces! Sneaker-toungue detailing, real ruffly skirt, collar and sleeve details for her shirt, the classic headband, and her bangs which look like they did in Sonic CD. Her face and spikes also seem to be quite well done, as she turned out really cute! Her thumb is detailed off the side of her hand as well, for a better look. They have done a fantastic job here, she is VERY 'classic Amy'. 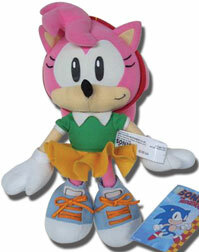 Any Amy fan will really want to own this plush! Made by GE Entertainment (for the classic line) in Winter 2009. 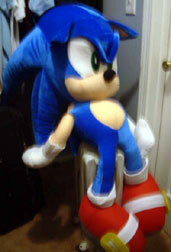 Photo discovered by SonicHOG. Since GE did it, it should available at internet retail like ToyGlobe etc. (Toys n Joys may also say they have this, but CAUTION they're known for never actually sending merchandise you buy! Buyer beware at Toys N Joys!). 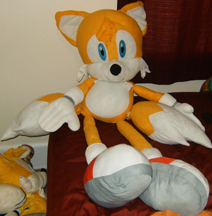 Ebay, and FYE (retail) may also have this plush. Always look for the tag! Almost ANY item can have a mistake! Always inspect before you buy. In this case the bow & top lace-hole piercing for the shoe is missing. 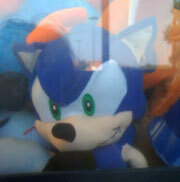 Here's a Sonic plush as seen through the glass of a crane game / UFO catcher. This was seen in the fall of 2009, which shows the Kelly Toy plushes are indeed showing up at 'amusements' as they said they would. This shot is of the 9 inch size. The largest sizes can be seen on Mutant Gear. Photo by Taaron. That particular shoe isn't finished, and they put it on anyway. Photo & owned by Eneko. 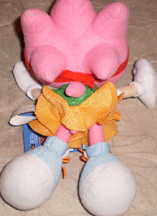 What is a keychain doing on the plushes page? Well really at SEVEN inches, could this even be called a keychain? It would be completely un-use-able. So rather, it's a plush with a clip on top for hanging. 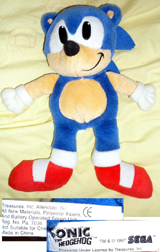 This item is under mild suspicion, as Knuckles shoes lack details and his head is pretty distorted...however, he does have a paper tag, which most bootlegs do not. You can see he's being sold by CuteSense which claims it's a USA item, but is it really? Dependent on further info, this item may be moved. Discovered by Trogdorbad It is reccommended to buy ANYwhere other than ToysNJoys. There have been MANY MANY complaints against this company for taking money and never sending merchandise. They are located in Hawaii, so they make postal claims and know that you can't come after them for it. Don't let this store fleece you! Order elsewhere despite their advertising. This is a Wisp from Sonic Colors. Wisps are a type of alien creature, introduced in that game. 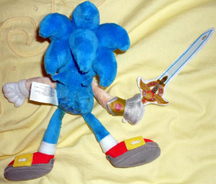 Each one can lend Sonic a different power. 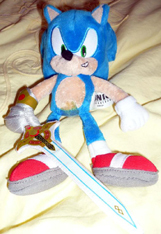 This is a give-away item or booth prize from E3 2010 from the Sega booth. No doubt people will want to collect wisps, so hopefully these can get produced regularly as well. Were there other wisps? Are there plans to make all the colors? Will they sell? Photo discovered by Berzerker. 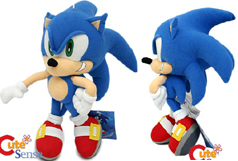 Here's a larger werehog plush from GE Entertainment! 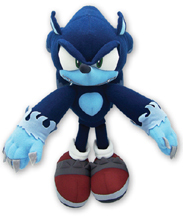 This plush is larger than the Jazwares version, and looks more werehog-like as well. It uses felt for the claws and the 'hair' around the wrists instead of fur fabric, but the effect is still all right. This is a giant size Kelly Toy Tails. He's 60 inches! That's a yard stick in the 2nd photo with him, not some small ruler. He has some differences from the above doll (no gray in ears, flat 'bangs', flatter hands, longer legs, larger eye-color areas) as well as a mistake (his nose is round, not a triangle) but he still looks quite nice, and cuter too with the appropriately sized eyes and center-smile. 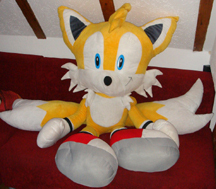 If you've got space in your house, this is a great giant plush to collect! 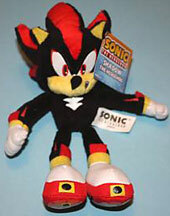 He is a 'prize only' plush. He can't be bought at retail, only won. Kelly Toy only sells these in bulk, to businesses. Carnivals, arcades & amusment parks would be a good place to look, aside from ebay...though it can be pricey to buy if you can't win.